"And thou, O Dagda," said Lug," what power canst thou wield on the Fomorian host in the battle?" "Not hard to tell," said the Dagda. "I will take the side of the men of Erin both in mutual smiting and destruction and wizardry. Under my club the bones of the Fomorians will be as many as hailstones under the feet of herds of horses where you meet on the battlefield of Moytura." "(d�h-da) Dagda 'The Good' or possibly = DOCTUS, 'The Wise.' God and supreme head of the People of Dana, father of Brigit (Dana); the Cauldron of the Dagda, one of the treasures of the Danaans; father and chief of the People of Dana; Kings MacCuill, MacCehct, and MacGren� grandsons of Dagda; portions out spiritual Ireland between the Danaans. Dagda Samildanac means: The Goodly-Wise Many-Gifted One." "The greatest of the Irish gods seems to have been the Dagda. His name meant the 'Good God', and he was also known as the 'Great Father' and the 'Mighty One of Knowledge'. He seems to have been specifically associated with Druidism as the god of Wisdom, a primal father deity of tremendous power. Two of the potent Celtic magical and spiritual symbols were the special attributes of the Dagda; the cauldron and the club or staff; in Irish Druidic tradition they were primal and pagan magical implements." " A powerful chieftain of the TUATHA DE DANAAN. Son of Ethliu; father of Angus Og. "His harp was called 'the Oak of Two Greens' and the 'Four-Angled Music'. With it he was able to play three kinds of music: the sorrow-strain, the laugh-strain and the sleep-strain. It was with the latter that he was able to subdue those Fomorians who had abducted his harper." "He was the guardian of the cauldron which satisfied all hunger, brought from Murias." 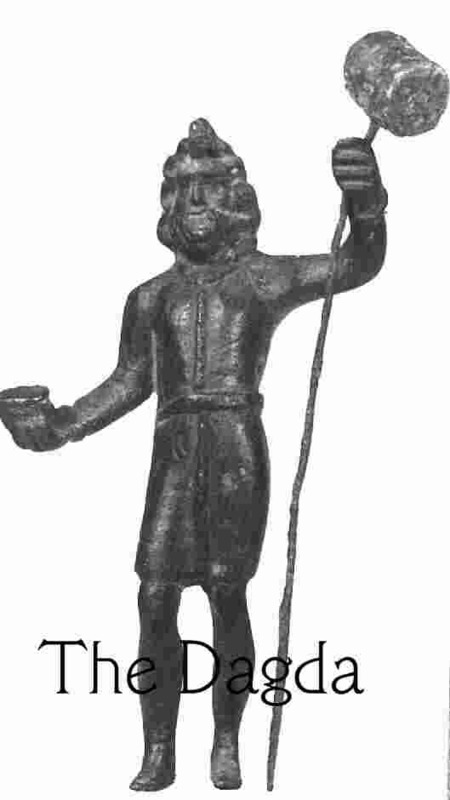 " His name means 'Good God', but his other names or titles are Eochaid Ollathair (All-Father) and Ruad Rofessa (Lord of Great Knowledge) indicating his similarity to the Wild Herdsman. He resembles the earlier Greek conception of Hercules." Encyclopedia of the Celts: An excellent source-see this site for more information on the Dagda!!! She brought forth the boy, and he was named, as Elotha had said, Eochaid Bres. When a week after the woman's lying-in was complete the boy had a fortnight's growth; and he maintained that increase till the end of his first seven years when he reached a growth of fourteen years. Because of the contest which took place among the Tuatha De the sovereignty of Ireland was given to the boy; and he gave seven hostages to Ireland's champions, that is, to her chiefs, to guarantee the restoring of the sovereignty if his own misdeeds should give cause. His mother afterwards bestowed land upon him, and on the land he had a stronghold built, called Dun Bresse; and it was the Dagda that built that fortress. Now when Bres had assumed the kingship, the Fomorians, --Indech son of Dea Domnann, and Elotha son of Delbaeth, and Tethra, three Fomorian kings, laid tribute upon Ireland so that there was not a smoke from a roof in Ireland that was not under tribute to them. The champions were also reduced to their service; to wit, Ogma had to carry a bundle of firewood, and the Dagda became a rath builder, and had to dig the trenches about Rath Bresse. The Dagda became weary of the work, and he used to meet in the house an idle blind man named Cridenbel, whose mouth was out of his breast. Cridenbel thought his own ration small and the Dagda's large. Whereupon he said: " O Dagda! Of thy honor let the three best bits of thy ration be given to me!" So the Dagda used to give them to him every night. Largge, however, were the lampooner's bits the size of a good pig. But those three bits were a third of the Dagda's ration. The Dagda's health was the worse for that. One day, then, as the Dagda was in the trench digging a rath, he saw the Mac Oc coming to him. "That is good, O Dagda," says the Mac Oc. "Even so," said the Dagda. "What makes thee look so ill?" said the Mac Oc. "I have cause for it," said the Dagda, " every evening Cridenbel the lampooner demands the three best bits of my portion." "I have counsel for thee," said the Mac Oc. He put his hand into his purse, took out three crowns of gold, and gave them to him. "Put these three gold pieces into the three bits which thou givest at close of day to Crindenbel," said the Mac Oc. "These bits will then be the goodliest on thy dish; and the gold will turn in his belly so that he will die thereof, and the judgment of Bres thereon will be wrong. Men will say to the king; "The Dagda has killed Cridenbel by means of a deadly herb which he gave him." Then the king will order thee to be slain. But thou shalt say to him:" What thou utterest, O king of the warriors of the Fene, is not a prince's truth. For I was watched by Cridenbel when I was at my work, and he used to say to me "Give me, O Dagda, the three best bits of thy portion. Bad is my housekeeping tonight". So I should have perished thereby had not the three gold coins which I found today helped me. I Put them in my ration. I then gave it to Cridenbel, for the gold was the best thing that was before me. Hence, then, the gold is inside Cridenbel, and he died of it." The Dagda followed this advice, and was called before the king.
" It is clear", said the king. "Let the lampooner's belly be cut open to know if the gold be found therein. If it be not found, thou shalt die. If, however, it be found, thou shalt have life." After that they cut open the lampooner's belly, and the three coins of gold were found in his stomach, so the Dagda was saved. Then the Dagda went to his work on the following morning, and to him cam the Mac Oc and said: " Thou wilt soon finish thy work, but thou shalt not seek reward till the cattle of Ireland are brought to thee, and of them choose a heifer black- maned." Thereafter the Dada brought his work to an end, and Bres asked him what he would take as a reward for his labor. The Dagda answered: " I charge thee," said he, "to gather the cattle of Ireland into one place." The king did this as the Dagda asked, and the Dagda chose of them the heifer which Mac Oc had told him to choose. That seemed weakness to Bress: he thought that the Dagda would have chosen somewhat more. The Dagda had a house in Glenn Etin in the north, and he had to meet a woman in Glenn Etin a year from that day, about Samain (Hallowe'en) before the battle. The river Unis of Connacht roars to the south of it. He beheld the woman in Unius in Corann, washing herself, with one of her two feet at Allod Echae (i.e. Echumech) , to the south of the water, and the other at Loscuinn, to the north of the water. Nine loosened tresses were on her head. The Dagda, conversed with her, and they made a union. "The bed of the Couple" is the name of the place thenceforward. The woman that is here mentioned is the Morrigu. Then she told the Dagda that the Fomorians would land at Mag Scetne, and that he should summon Erin's men of art to meet her at the Ford of Unius, and that she would go into Scetne to destroy Indech son of Dea Domnann, the king of the Fomorians and would deprive him of the blood of his heart and the kidneys of his valor. Afterwards she gave two handfuls of that blood to the hosts that were waiting at the Ford of Unius. "Ford of Destruction" became its name, because of that destruction of the king. Then that was done by the wizards, and they chanted spells on the hosts of the Fomorians. This was a week before Samain, and each of them separated from the other until all the men of Ireland came together on Samain. Six times thirty hundred was their number, that is, twice thirty hundred in every third. Then Lug sent the Dagda to spy out the Fomorians and to delay them until the men of Ireland should come to the battle. So the Dagda went to the camp of the Fomorians and asked them for a truce of battle. This was granted to him as he asked. Porridge was then made for him by the Fomorians, and this was done to mock him, for great was his love for porridge. They filled for him the king's cauldron, five fists deep, into which went four-scored gallons of new milk and the like quantity of meal and fat. Goats and sheep and swine were put into it, and they were all boiled together with the porridge. The were spilt for him into a hole in the ground, and Indech told him that he would be put to death unless he consumed it all; he should eat his fill so that he might not reproach the Fomorians with inhospitality. At the end of the meal he put his curved finger over the bottom of the hole on mold and gravel. Sleep came upon him then after eating his porridge. Bigger than a house-cauldron was his belly, and the Fomorians laughed at it. Then he went away from them to the strand of Eba. Not easy was it for the hero to move along owing to the bigness of his belly. Unseemly was his apparel.. A cape to the hollow of his two elbows. A dun tunic around him, as far as the swelling of his rump. It was moreover, long breasted ,with a hole in the peak. Two brogues on him of horse-hide, with the hair outside. Behind him a wheeled fork to carry which required the effort of eight men, so that its track after him was enough for the boundary-ditch of a province. Wherefore it is called"The Track of the Dagda's Club"
For More info,go to The Second Battle of Mag Tured(Moytura) Part of a larger webpage that I reccomend.